A Chicago bootlegger recently remarked that there was at least one honest official in that town—Pat Roche, chief investigator for the State’s Attorney—who couldn’t be “fixed.” For eight years Roche was a special agent for the treasury on the trail of crooked dry agents. He tells here the inside story of the rum runners, and why they flourish. IN TWO weeks’ time a few years ago, on the strength of a set of credentials purporting to show that I was a prohibition agent, I had $85,000 in bribes handed me as my share of the money being paid a small ring of dry agents in New York. “Important money,” as the gangsters call thousand dollar bills when handed out in fist-fuls, can be had at any time, usually without even the asking, by any official of the prohibition or customs services. Less important money can be had by any of untold thousands of policemen, sheriffs, deputies, highway patrolmen, state policemen, township constables and politicians—everybody, in fact, who comes in contact with the vast business of transporting and selling liquor. Is it any wonder that enough of them fall for the graft to make the liquor business a fairly safe gamble? Most of the men who can make anywhere from $100 to $100,000 by turning the head or being in the wrong place at the right time are earning in the neighborhood of $50 to $75 a week. I was never a bona fide prohibition agent, but for eight years I was a special agent of the treasury department working, chiefly, to trap crooked dry agents. To do that we usually had to trap the bootleggers and rum runners with whom they dealt, so I saw plenty of the inside of the rum game. If you draw a line around the United States, about 250 to 300 miles back from the border, you have marked off the chief rum running territory. In the vast hinterland the local moonshiner, the cheating druggist, the home brew maker, and the peddler of poisonous extracts and concoctions is the chief source of supply for intoxicants. 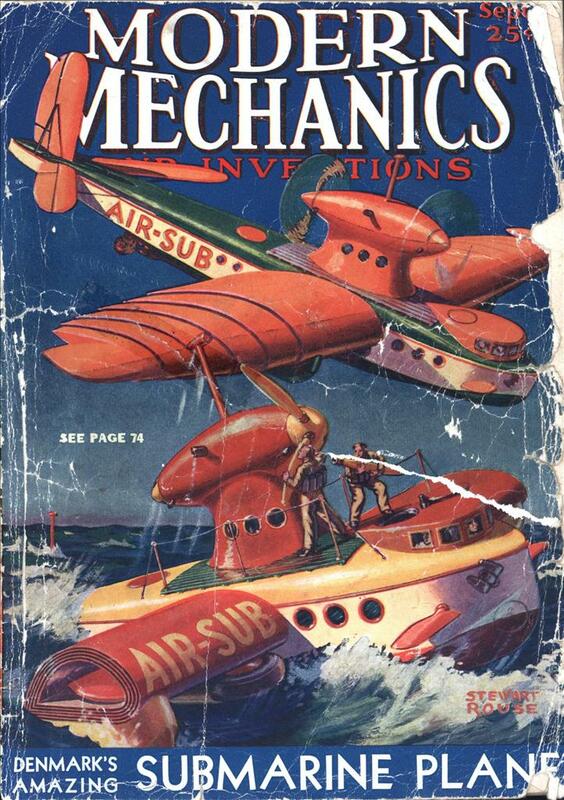 But within a night’s automobile ride of the rum ships along the coast, the export docks of Canada—which are now going out of business—and the Mexican border is the habitat of the rum runner and the big time bootlegger. It costs, or has cost while the export docks along the Detroit river flourished, about $20 to grease the way for a case of liquor to reach Chicago. Five dollars went to the boatman who ferried the case across the river; $5 to the guard who let it slip past the border, and $10 smoothed the way through Michigan and Indiana into Chicago. A case of standard brands of Scotch, in 40 ounce, imperial quarts, commission wrapped—that is, bearing the seals and wrapping of the Quebec Liquor Commission—costs $65 in Canada. Add $20 for graft, and the cost of running the liquor down by automobile, 20 cases to a load, and the case costs about $87, delivered in Chicago. The market price is around $125 to $135, depending on the supply. But you can buy commission wrapped Scotch in Chicago for $55 to $65 a case! The answer is cutting plants, fake labels, fake stamps, and fake wrapping. The Quebec Liquor Commission has a special wrapping paper, with red, blue and green threads woven into it, just like the American treasury notes. But we have seized vast quantities of counterfeit paper that couldn’t be told from the genuine if we didn’t know the liquor commission controlled all the genuine supply. The cutting plant buys large quantities of genuine liquor from the runners, opens the bottles, and adds an equal part of alcohol and an equal part of water, making three cases out of one. Flavoring and coloring matter also are added to bring the taste and appearance up to the original. Bottles, either purchased new from glass plants which make them to order and duplicate any foreign product in shape, size and appearance, or bought from old bottle dealers who have built up a market for empties, are used. The finished product can not be told from the original. If the alcohol used in cutting is pure grain, the product itself is no more harmful than the original pure liquor. If it is re-cooked denatured alcohol its harmfulness depends on the skill of the cooker and the state of his equipment. Nobody can remove the government formula denaturants completely, for their evaporation point is too near that of pure alcohol, and some is bound to pass over with the alcohol vapor to be condensed. An expert cooker can produce a product that is virtually harmless, but so few of them are expert, and, working in dirty basement hideaways, with dirty equipment, they actually cook into the product poisons that were not there before. Low grade alcohol, produced from corn sugar or other sources, is also largely used in faking real liquor. There again the dirt and poisons from insanitary equipment are the chief source of danger. Counterfeit American brands have virtually disappeared, and with them has disappeared the counterfeiting of internal revenue strip stamps on a large scale. A certain amount is still made, and only yesterday 17 men, including 11 from Chicago and three from New York, two from Milwaukee and one from Rock Island, were sentenced in a Chicago federal court for that crime. I broke up one of the biggest counterfeiting rings in history here in Chicago a few years ago and for a time put fake strip stamps off the market. The tricks by which liquor is slipped past the borders and moved to the nearby cities are legion. It’s a pretty safe bet, though, that tricks alone don’t move one case in 100. Somewhere along the route graft must be paid. 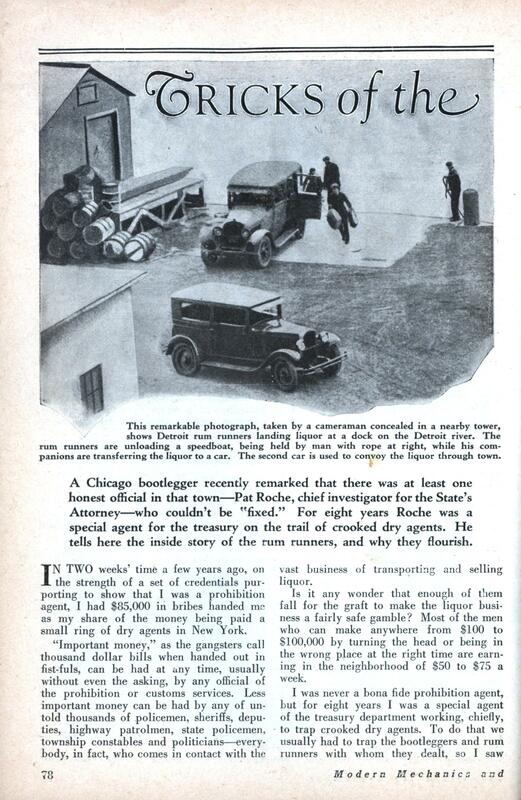 Automobiles are largely used to bring liquor into Chicago. Standard sedans are turned over to expert body builders who specialize in building hidden compartments. A standard five passenger sedan can be altered to hide twenty cases of 12 bottles each, without any of the secret compartments being visible, even under close scrutiny. That’s 240 quarts, and it seems almost impossible to hide that many bottles in the backs of the seats, the sides and the roof of a car without causing undue bulging, but it is being done right along. The tricks along the sea coast are equally unique. Just the other day a fishing boat came into New York, apparently with a solid concrete ballast in the hold. Dry agents who ripped out the concrete found it was only a thin floor, with a fortune in liquor under it. Some liquor, after it reaches this country, is shipped by rail as freight in large lots, or as express in small quantities. The usual express dodge is to pack six bottles in a tin can, solder it tight, so if one is broken it can’t leak, and pack two tins to a box. The shipper has labels printed purporting to show he is a dealer in radio parts, printing plates, or some similar product that would be shipped in boxes of about that size and weight. The buyer pays cash in advance. If the shipment is detected and confiscated by government agents, it is the buyer who loses his money. If a bootlegger was a person who wore boots on his legs, wouldnt that be awesome!!!?? ?